The snow blew vertically across the landscape as we made our way to the river; ideal conditions for spring mayflies and not necessarily so for those who fish. Entering the canyon a patch of blue sky lay visibly obscured above us. At first glance the winds ferocity disheveled the trees and tugged at the surface of the water, but the snow had begun to dissipate. Further upriver an impoundment showed little change in the winds temperament. 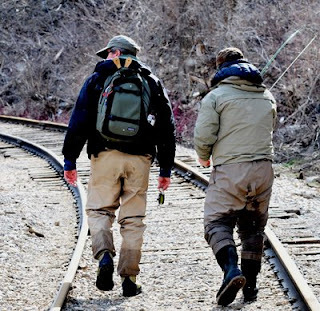 To our amazement the canyons turnouts were void of any vehicles, the river undisturbed by the presence of any anglers; an anomaly for this fishery even under such challenging conditions. By the time we arrived in the canyons upper reaches the wind had begun to disperse. Still no signs of legged’s, leaving us with unbridled choices. In the three decades I’ve fished here, I’ve only fished in solitude in dawns first light, but never at this late hour. I ponder the likelihood of ever witnessing such an unprecedented act of emptiness again. I expect another vehicle or two to join us as we get dress and rig our rods, yet to our dismay none do. The steep bank that we must navigate to reach the river is covered in snow. Cautiously we descend. Once we reach the river bottom, we spread out, knowing there’s no one here. The suns rays maybe warm, but the canyon breeze adds a slight bit of discomfort to the air, yet it’s far more pleasant than the other days I’ve fished here this season. Upstream a break of mature conifers shelters our casts and waters from the wind. Midges scurry about, and a blue wing or two drifts uninterrupted on the rivers placid currents. On the far bank, the afternoon’s first rise grabs my attention. Lazily I ponder the situation, soaking in the sun, patiently waiting for the hatch to mature before committing. Like magic the delicate insects appear, their numbers increasing, drifting haplessly like toy sailboats waiting for their wings to dry anticipating flight. It’s an amazing struggle given their size and the environment they must navigate to reach adulthood. Eventually several of the rivers larger trout are attracted to the waters surface. From where I sit I watch a nice brown track a single blue wing olive, drifting back several feet before leisurely opening it’s mouth; water and mayfly cascading into its gullet. Before I leave it will take one of my flies in the same confident fashion, settling back in its lie before feeling the pressure of the line that now connects us coming tight. 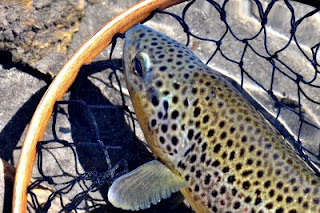 Twice the brown clears the water, its plumb body shimmering in the late afternoon sun before reluctantly sliding into my net. These fish have wintered well, evidence of last year’s good flows. I admire this final trout’s large black spots and those prisms of color that are unique to Salmo trutta. It’s a far larger brown than I anticipated, although it felt heavy on the line. It’s broad pectoral fins flare, stabilizing its body in the cool current. With a gentle thrust of its tail it slides from my outstretched hand. I secure my fly to the rod and reel in the slack eventually retaking my position on the bank in the sun content with the day. 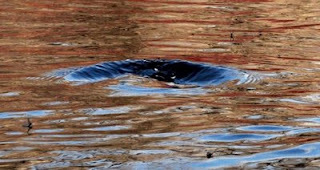 As the pool mends, its trout settle again feeding confidently on the carpet of blue wings. Quietly I sit and watch. For the first time since I started casting I hear the wind whistle through the adjacent hillside of protective pines. For the moment time slows as only it can on a river so unfettered. After a while I gathered my reluctant companions. 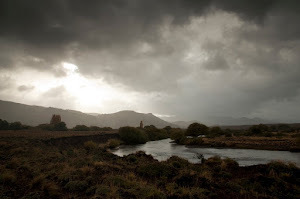 The rivers trout continued to rise, tempting our retreat. We pause periodically taking in a river bathed in afternoons soft light, its currents still void of anglers, its trout feeding undisturbed, an image and a day we all store in the memory banks knowing it my never happen again.